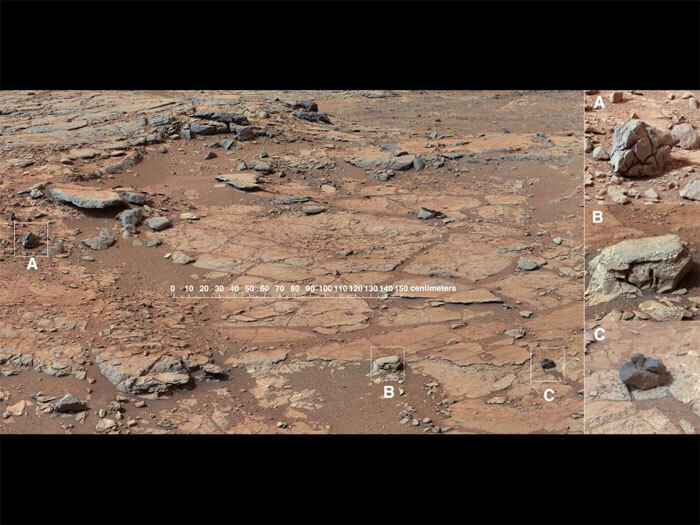 This set of images shows the similarity of sulfate-rich veins seen on Mars by NASA's Curiosity rover to sulfate-rich veins seen on Earth. The view on the left is a mosaic of two shots from the remote micro-imager on Curiosity's Chemistry and Camera (ChemCam) instrument on Dec. 14, 2012, or the 126th sol, or Martian day, of operations. 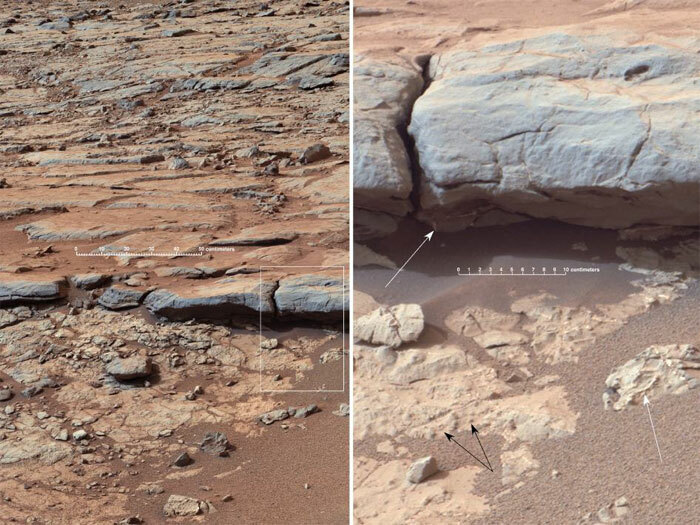 They show a view of "Sheepbed" rock in the "Yellowknife Bay" area of Mars. The sulfate-rich veins are the light-colored veins about 1 to 5 millimeters (0.04 to 0.2 inches) wide. The image on the right is from the Egyptian desert on Earth. A pocket knife is shown for scale (image courtesy of Pierre Thomas). On Earth, calcium sulfates like gypsum form frequently in veins when relatively dilute fluid circulates at low to moderate temperatures. This image from the right Mast Camera (Mastcam) of NASA's Curiosity Mars rover shows roughly spherical features. These are called spherules, and they are common in this stratigraphic unit, the Sheepbed Unit, which defines the lower part of the sequences of strata exposed in "Yellowknife Bay." These features are interpreted as concretions, implying they formed in water that percolated through pores in the sediment. 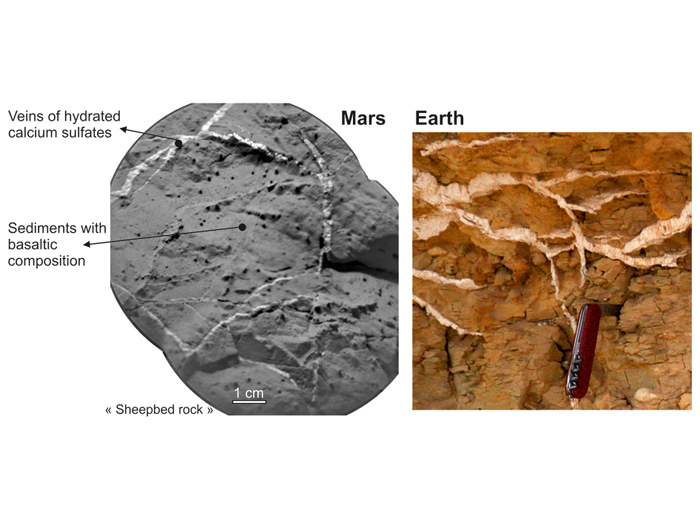 Spherical concretions have previously been discovered in other rocks on Mars. Mastcam obtained these images on the 139th Martian day, or sol, of Curiosity's surface operations (Dec. 25, 2012). The image has been white-balanced to show what the rock would look like if it were on Earth. This image from the Mast Camera (Mastcam) on NASA's Mars rover Curiosity shows inclined layering known as cross-bedding in an outcrop called "Shaler" on a scale of a few tenths of meters, or decimeters (1 decimeter is nearly 4 inches). The superimposed scale bar is 50 centimeters (19.7 inches). See unannotated version. This stratigraphic unit is called the Shaler Unit. Decimeter-scale cross-bedding in the Shaler Unit is indicative of sediment transport in stream flows. Currents mold the sediments into small underwater dunes that migrate downstream. When exposed in cross-section, evidence of this migration is preserved as strata that are steeply inclined relative to the horizontal -- thus the term "cross-bedding." The grain sizes here are coarse enough to exclude wind transport. 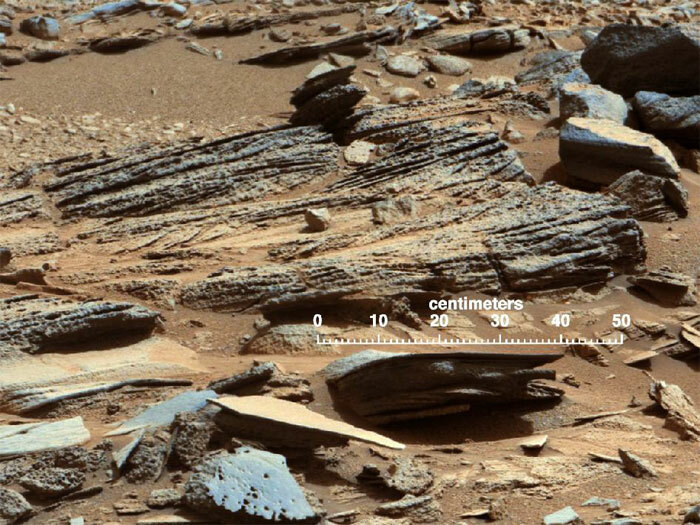 This cross-bedding occurs stratigraphically above the Gillespie Unit in the "Yellowknife Bay" area of Mars' Gale Crater, and is therefore geologically younger. Mastcam obtained the image on the 120th Martian day, or sol, of Curiosity's surface operations (Dec. 7, 2012). 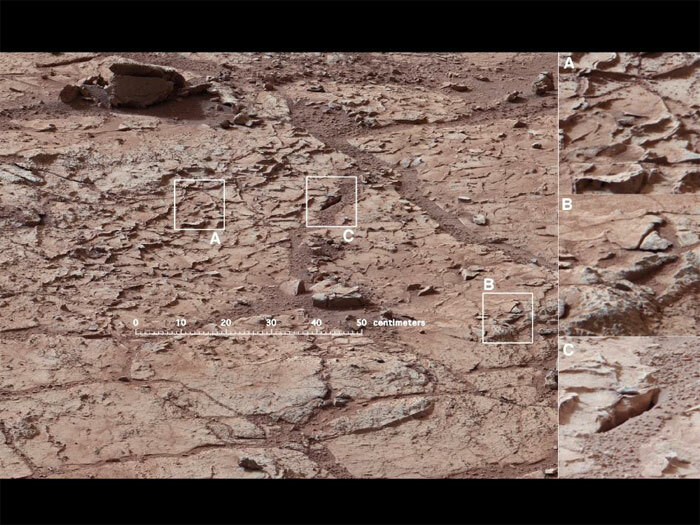 This set of images from NASA's Curiosity rover shows a patch of rock before and after it was cleaned by Curiosity's Dust Removal Tool (DRT). The images, obtained by the Mars Hand Lens Imager (MAHLI), show the first use of the DRT on Jan. 6, 2013, the 150th sol, or Martian day, of operations. MAHLI took this image from a distance of about 10 inches (25 centimeters) after the brushing was completed on this rock target, called "Ekwir_1." The patch of the rock from which dust has been brushed away is about 1.85 inches by 2.44 inches (47 millimeters by 62 millimeters). 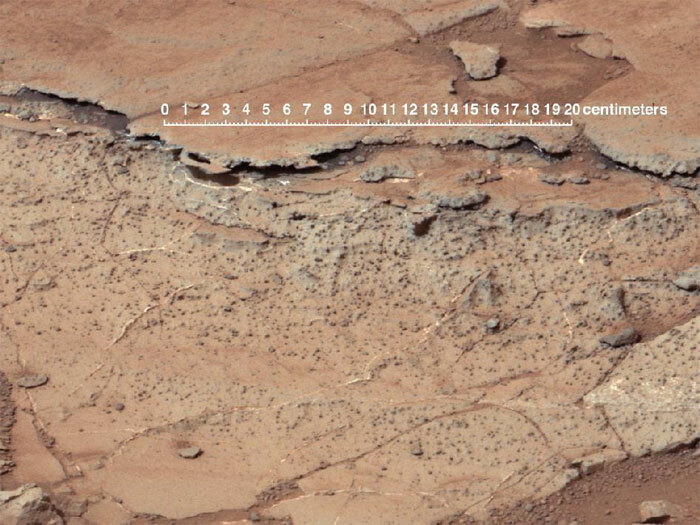 The right Mast Camera (Mastcam) of NASA's Curiosity Mars rover provided this contextual view of the vicinity of the location called "John Klein," selected as Curiosity's first drilling site. The distance from the camera to John Klein was about 16 feet (5 meters). The scale bar is 150 centimeters (59 inches) long. An unannotated version is also available. This mosaic was assembled from images acquired on Sol (or Martian day) 138 between 8:30 and 9:25 in the morning, local Mars solar time (on Dec. 25, 2012). 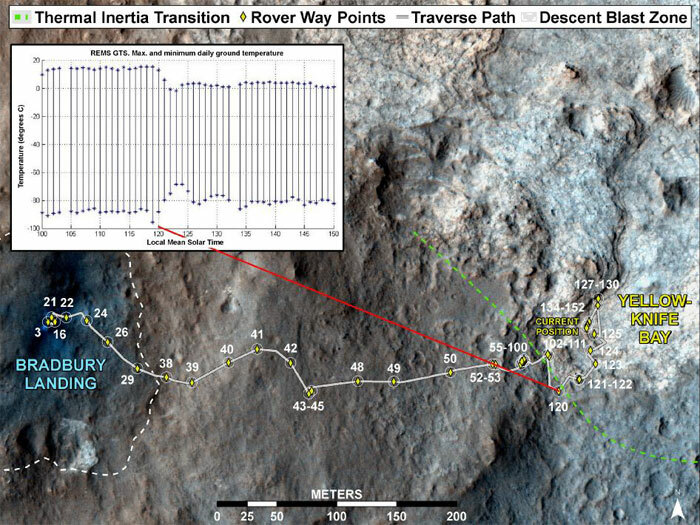 It illustrates the diversity of rock types from which the rover team could choose to sample. The enlargements of rocks seen on the right, and denoted by letters and boxes within the left image, represent this diversity. Each box is about 9 inches (22 centimeters) square. Enlargement A shows a "bread-crusted" rock, whose surface is fractured in a polygonal pattern. This generally reflects a differential change in volume of a rock, with the outer part expanded relative to the interior. Enlargement B is representative of the material that will be sampled at the John Klein site, showing both light-toned veins and dark spots that show the relief of concretions. Enlargement C shows an exotic black rock that is similar in shape to more distant, dark rocks found higher in the local stratigraphy. That rock was probably emplaced here as part of material ejected by a crater-excavating impact. This image from NASA's Curiosity rover shows the great diversity of grains found on the surface of a Martian rock. The rock, called "Gillespie Lake," was imaged by Curiosity's Mars Hand Lens Imager on Dec. 19, 2012, the 132nd sol, or Martian day, of operations. 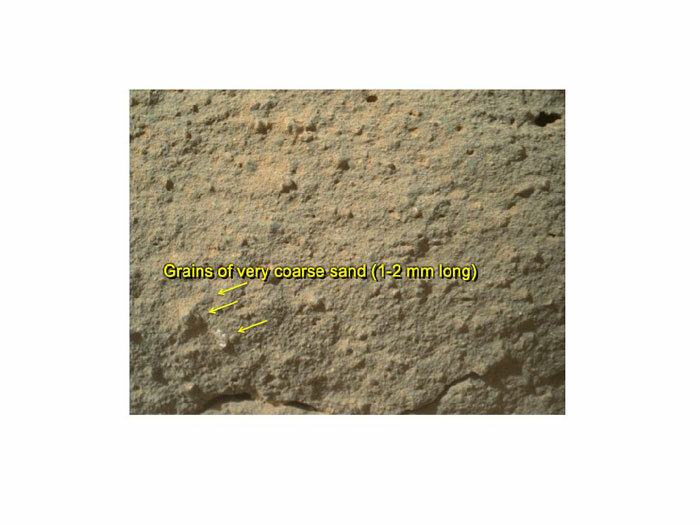 The grains highlighted in the annotated version of this image are about 1 to 2 millimeters (0.04 to 0.08 inches) long and the full frame is about 3 to 5 centimeters (1 to 2 inches) across. Some grains look similar to clear crystal in appearance while others are darker and duller in appearance. This graphic from NASA's Curiosity mission shows close-ups of light-toned veins in rocks in the "Yellowknife Bay" area of Mars together with analyses of their composition. 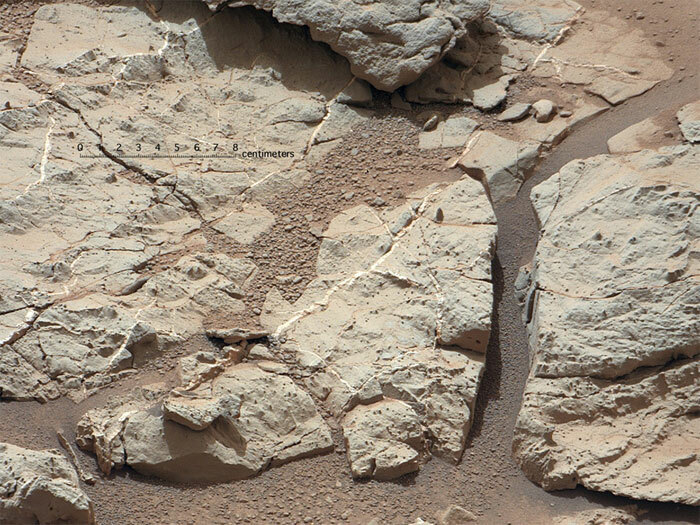 The top part of the image shows a close-up of the rock named "Crest," taken by the remote micro-imager (RMI) on Curiosity's Chemistry and Camera (ChemCam) instrument above the analysis of the elements detected by using ChemCam's laser to zap the target. 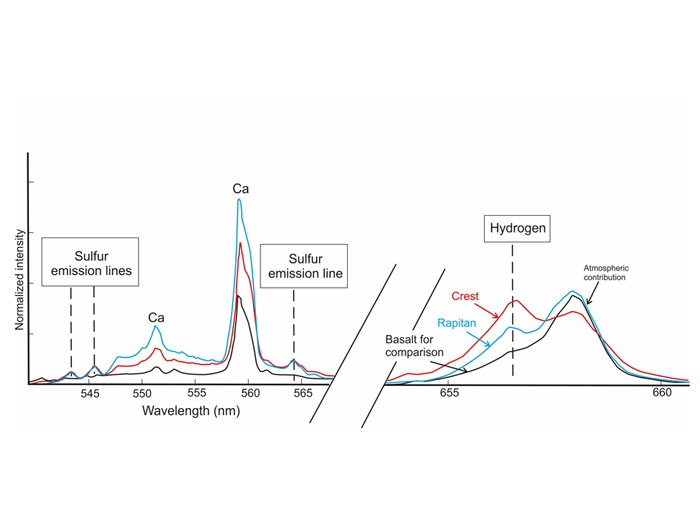 The spectral profile of Crest's light-colored vein is shown in red, while that of a basaltic calibration target of known composition is shown in black. 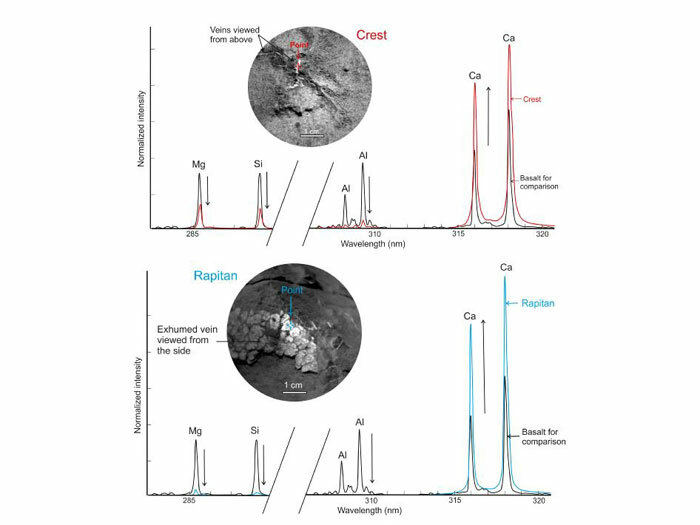 The bottom part of the image shows ChemCam's close-up of the rock named "Rapitan" with the analysis of its elemental composition. The spectral profile of Rapitan's light-colored vein is shown in blue, while that of a basaltic calibration target of known composition is shown in black. These results suggest the veins are unlike typical basaltic material. They are depleted in silica and composed of a calcium-bearing mineral. The ChemCam instrument took the RMI pictures and zapped lasers on Crest on Dec. 13, 2012, or the 125th sol, or Martian day, of operations. The ChemCam instrument took the RMI pictures and zapped lasers on Rapitan on Dec. 23, 2012, or the 135th sol, or Martian day, of operations. Mastcam obtained these images the 126th Martian day, or sol, of Curiosity's mission on Mars (Dec. 13, 2012). The view covers an area about 16 inches (40 centimeters) across. A superimposed scale bar is 8 centimeters (3.15 inch) long.